The Sony VAIO VPCCW1S1E/R is part of the CW Series of the Japanese company's latest mid-range laptop, offering all the style and features we've come to expect from high-end VAIO laptops, but at a far more affordable price. It's not the most portable choice here, but it is a great all-rounder. 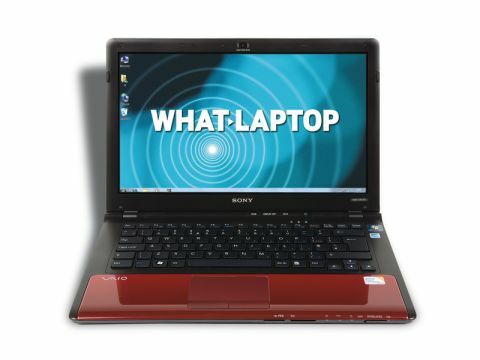 The 14-inch screen is a good size for those wanting a home laptop that they can also take on the road. It's large enough to carry out all tasks comfortably, yet still portable enough to easily pack away. It's a very bright display, although colours aren't quite as deep as previous VAIO models, looking slightly more true to life with brightness levels turned down. Within the compact yet chunky chassis, Sony has crammed in a powerful Nvidia GeForce GT 230M graphics card. With 512MB of dedicated video memory, it provides outstanding multimedia power for a laptop of this size and easily rivals larger systems. We were able to play the latest resource-intensive games without any trouble with detail settings turned up fairly high, and all home multimedia applications we tested ran with ease. The keyboard is a model of comfort, with large keys that offer a perfect typing action. The isolated key design – with each key protruding through individual holes in the chassis – creates plenty of space between the keys and makes it easier to type at speed without mistakes. The touchpad is large and responsive, rounding off the excellent interface. This machine is available in a range of colours, including pink, blue and red. Following feedback from customers, Sony has toned down the inside of the machine, with the conservative black keyboard and screen surround finished neatly by a colourful raised palmrest. The result is stylish and easy on the eye, although at 41mm in depth the chassis is quite a lot thicker than some of its rivals. Quality is good, with the screen held firmly in place when typing. The thick lid provides ample protection for the display, although some of the plastics around the keyboard flex slightly under pressure. Potent office performance is on offer thanks to the 2.13GHz Intel Core 2 Duo processor and 4096MB of fast DDR3 memory, and we were able to multitask without the system slowing down noticeably. Battery life, at 256 minutes, is impressive. The 320GB hard drive provides reasonably storage space, although it is bettered by the Toshiba Satellite U500-12C. We're very impressed by Sony's VAIO VPCCW1S1E/R. It may be slightly bulkier than some of the other laptops, but it truly is a laptop you can use for any occasion, topped off by a neat design and an excellent user interface.